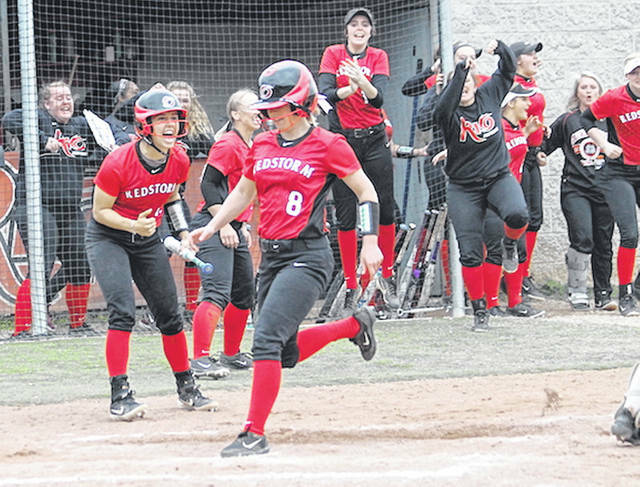 Rio Grande’s Cammy Hesson (8) scores the winning run in Friday’s 4-3, nine-inning game two win over Indiana University Southeast at Rio Softball Park. RIO GRANDE, Ohio — Lexi Philen’s one-out, two-run single in the bottom of the ninth inning capped a dramatic three-run rally and lifted the University of Rio Grande to a 4-3 game two victory and a doubleheader sweep of Indiana University Southeast, Friday afternoon, in River States Conference softball action at Rio Softball Park. Rio Grande, which posted a 4-1 win in the opener of the twinbill, improved to 22-10 overall and 12-0 in conference play as a result of the sweep. IU Southeast, which entered the day in second place in the RSC standings, two games behind the RedStorm, slipped to 16-16 overall and 7-3 inside the RSC. The Grenadiers appeared on their way to salvaging a split of Friday’s doubleheader by scoring twice in the top of the ninth inning of the nightcap to snap a 1-1 deadlock. Sophomore Mary Pica (Minford, OH) began the inning by depositing a 1-0 pitch from IUS starter Becca Schoenung over the fence in left-center field, pulling Rio to within 3-2. Senior Carly Skeese (Newark, OH) followed with a single to left-center, prompting Southeast head coach Joe Witten to lift Schoenung in favor of Emily Weiss, who started and went the distance in suffering the game one loss for the Grenadiers. Weiss induced sophomore Aubrey Azbill (Miamisburg, OH) to force Skeese at second with a fielder’s choice grounder to third, but a bloop single to right by sophomore Cammy Hesson (Point Pleasant, WV), a wild pitch and an intentional walk to junior Michaela Criner (Bremen, OH) loaded the bases. Philen, a junior from Tallmadge, Ohio, then came to the plate and blistered a 2-1 offering from Weiss just inside the third base bag and down the left field line, allowing Azbill to score the tying run and Hesson to scamper home with the game-winner. Sophomore starter Raelynn Hastings (Commercial Point, OH) went the distance for the RedStorm to get her 11th win in 15 decisions. The right-hander allowed seven hits and three runs – two earned – while striking out two. Philen finished 2-for-5 in the win, while senior Kelsey Conkey (Minford, OH) went 2-for-3 with a game-tying solo home run in the bottom of the sixth inning. Criner added a double in the winning effort. Baylee Krueger went 2-for-2 with a double and a run batted in for IUS, while Justice Kline had a double and an RBI of her own. Sydney Seger, Maggie Lubbehusen and Ashtyn Sharp had one double each for the Grenadiers. In game one, Conkey tossed a complete game four-hitter and came within one out of tossing a third straight shutout. A two-out RBI double by Sharp in the seventh inning plated the lone IUS run. Conkey walked two and struck out four en route to her nine win in 13 decisions. Weiss allowed 10 hits and four runs over six innings in suffering the loss for the Grenadiers. Rio got all the runs it would in the first inning thanks to RBI doubles by the freshman duo of Kenzie Cremeens (Ironton, OH) and Taylor Webb (Willow Wood, OH), while Skeese had a run-scoring single in the third and Cremeens had another RBI hit in the fourth. Cremeens, Conkey and Criner all had two hits in the win. Criner and Conkey’s hit totals both included doubles. Rio Grande is scheduled to return to action at Kentucky Christian University on Tuesday. First pitch is scheduled for 3 p.m. in Cannonsburg, Ky.